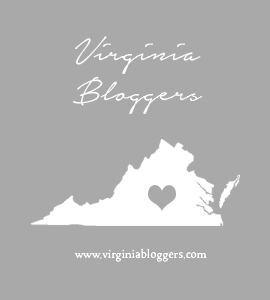 This post contains affiliate links for products I use and love. 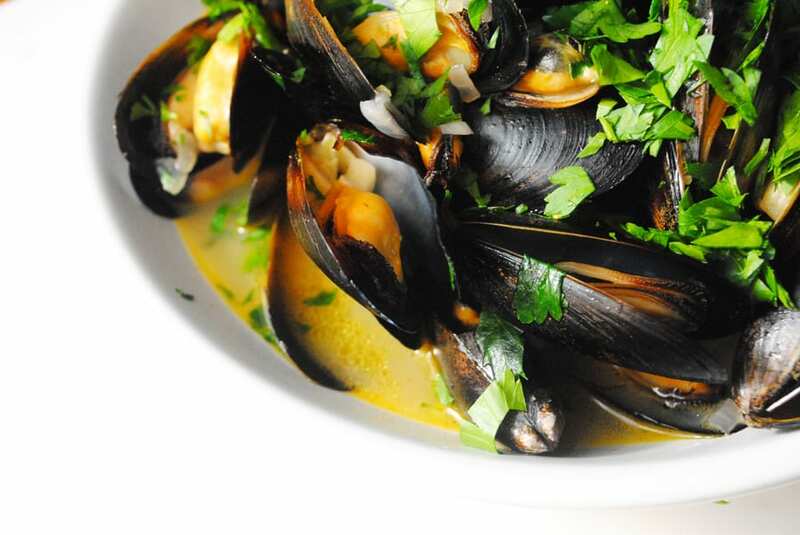 Mussels generally come in two camps, white wine broth or tomato based broth. While I don’t discriminate against any mussel put before me, I do prefer a nice buttery white wine broth. 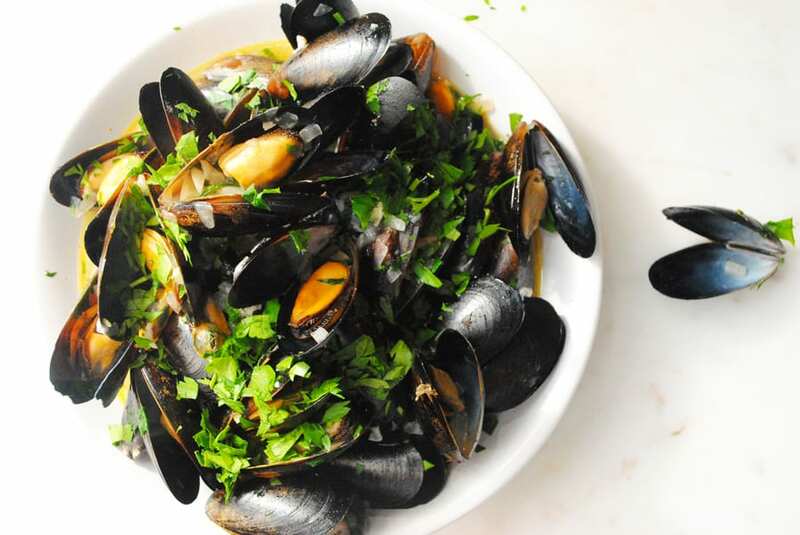 Mussels with White Wine are so easy to make, come together in under 15 minutes and are CHEAP! I prefer to buy the mussels you find in the freezer section of the grocery store. They are already cleaned and debearded. My supermarket has them in a freezer case by the fresh seafood. Walmart also has frozen mussels. They sell mussels with broths already frozen with them, but I like to make my own and get the plain frozen mussels. You generally get a lot more for the money too. You can absolutely use this recipe for fresh mussels as well. Just make sure to clean and debeard those puppies. Here’s a good article from Epicurious on the process. For fresh mussels the best season to eat them in from October to March. Just FYI. I like to use a large dutch oven to cook these. You need a large pot with a lid. Dutch ovens are so pretty to serve these bad boys out of too. 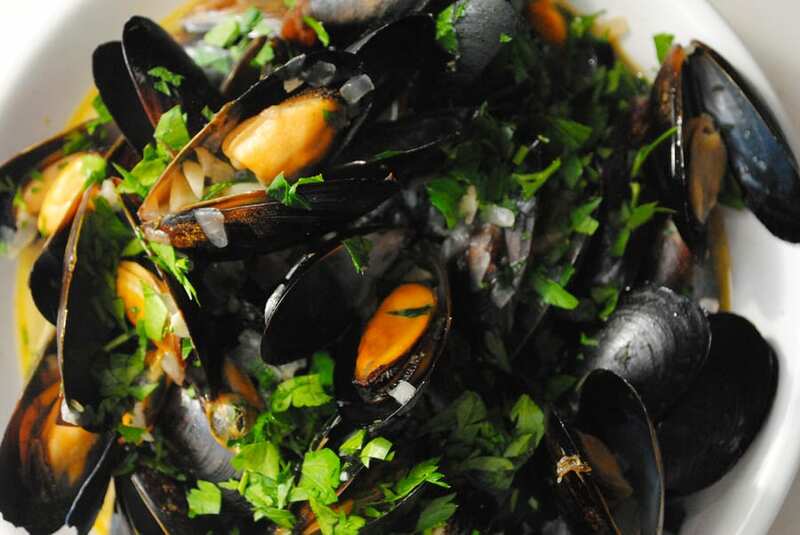 Mussels with White Wine can be served as an appetizer, or as a meal. I like to serve it with a crusty loaf of bread and a simple side salad, or Roasted Garlic Broccoli. As for the White wine use something you like to drink. I love Chardonnay and that’s what I used, but you could use Prosecco, Sauvignon Blanc, Pinot Gris, just stay away from the overtly sweet Moscato or Riesling. In a large pot with a lid, melt the butter over medium heat. Add in the onion and garlic. Cook until just beginning to soften. Add the wine and salt and cook for two minutes to reduce the wine. Pour in the broth, 3/4 of the parsley, cayenne pepper, and the mussels. Stir as well as you can, then cover with the lid and let it cook for 10 minutes. Stirring occasionally. Spoon the mussels into a large bowl and pour the broth over the top. Garnish with the rest of the chopped parsley. Serve with a crusty loaf of bread to sop up the broth and a cold glass of white wine to wash it down.